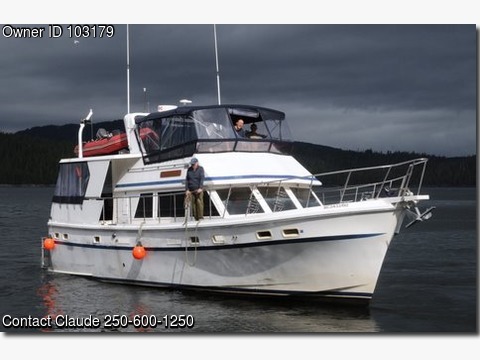 Please call owner Claude at 250-600-1250. Boat Location: Prince Rupert, British Columbia, Canada. Twin engines , twin stations, 3 stateroom, trawler motor yacht, designed after the famous 48 Hatteras motor yacht, large enclosed command bridge,super large enclosed sun room with bar and granite counter tops.Interior all teak including hand laid teak parquet floor throughout ,large shower room,vacuum flush toilet in center bathroom , front stateroom has separate bathroom, Webastco diesel fired hydronics heating system, 2000 watt Magnum pure sine wave inverter, charger, auto pilot,7.5 kw Westerbecke diesel generator ,large house battery bank, engine have 1500 hours on rebuild total hours 2770 hours all documents available for viewing , new 20 gallons stainless steel water heater with coil, surround sound system with flat screen TV and DVD player, computer and monitor with nobelteck navigation program , Furuno digital depth sounder, Force 10 stainless steel propane range with oven, Trash compactor,freezer and refrigerator and microwave oven, dishes and cooking equipment, on the back deck is a 12 volt crane and a cradle for a 12 foot inflatable, ground gear consists of 200 foot chain, 200 foot line and a 110 lbs anchor , anchor winch is a 3000 watt Lofrance tigres winch , all window, command bridge and sundeck covers are made of sunbrella material and are recent and in excellent condition with no rips, stored inside in a heated space during the winter months.